The OCRegister newsroom is about to get a whole lot more mobile. Since the Freedom Communications mobile strategy was approved in February 2010 the company has, among other things, launched countless apps, built its own mobile websites, started adapting the content we produce so it is accessible and optimized for more devices, launched a whole series of niche news alerts, deployed a news alert system making it simple and fast to send news alerts, launched an iPad app in September (with the new version of the app launching this week) and starting to guide advertisers in how to reach these mobile audiences. And now the newsroom is going full mobile. Mojos Unite – A place for mobile journalists to share thoughts and information. Google Reader bundle – A selection of suggested mobile journalism blogs and websites. Mojos list on Twitter – A list of suggested mobile journalists to follow on Twitter. Mobile is becoming more a part of what the collective newsroom does every day. When the OCRegister mobile app launched in April 2010, there was very little people could do but use the app and offer feedback. Today, an alerts system built into our online CMS allows more people to meet the needs of our growing mobile audience. So far, the OCRegister offers 24 streams of news alerts on a variety of topics including breaking news, fast food, the Anaheim Ducks, wildfires and Huntington Beach. 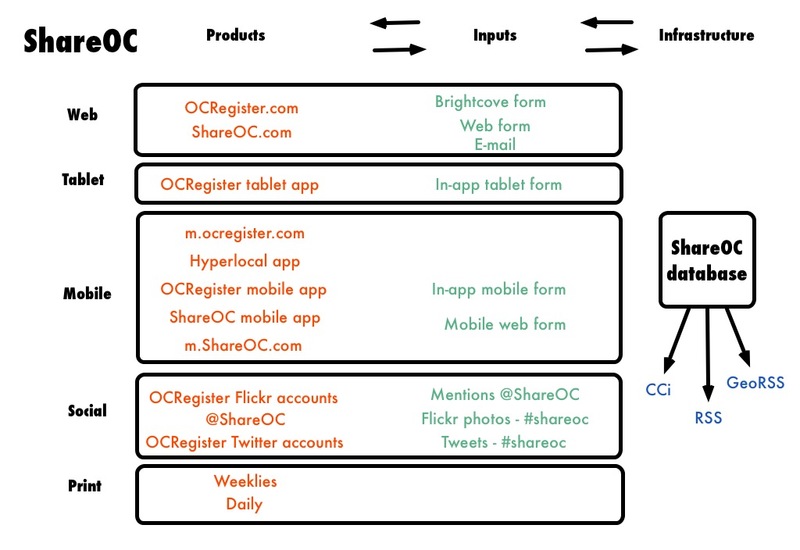 Here’s a bit more on the ShareOC project that I have brewing off to the side of my normal work. 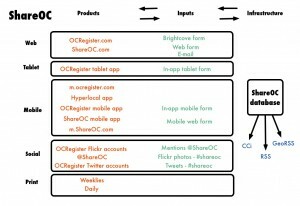 The diagram shows how the database is the main component (rather than a website) – with connections in web, tablets, mobile (smartphones), social networks and in print. After working a weekend reporting shift on Saturday covering a nasty 10-car wreck I was checking up on our mobile stats Monday afternoon. I noticed that our mobile website had its best day on Sunday, about 5,000 page views more than the previous best (the previous best was a very rainy day in November). So, I thought I’d compare our mobile traffic (web and apps) to that seen on the desktop website and I found out that we hit 24% mobile share Sunday and 25% Saturday. One tweet about that led to an article on Poynter talking about our best mobile day and why.